Were playing a set for Rob & Kersten’s wedding party at the Montague arms in New cross on the 31st of October. Supporting Long Tall Texans and Go Go Cult! We’re on the bill for AÂ Night of Psychobilly MayhemÂ on the 17th of October in Nambucca. Also on the bill is Stage Frite,Â Luna Vegas and Jack O’Bones. Meantraitors had to cancel due to Visa issues so Stage Frite has been added to the bill instead. 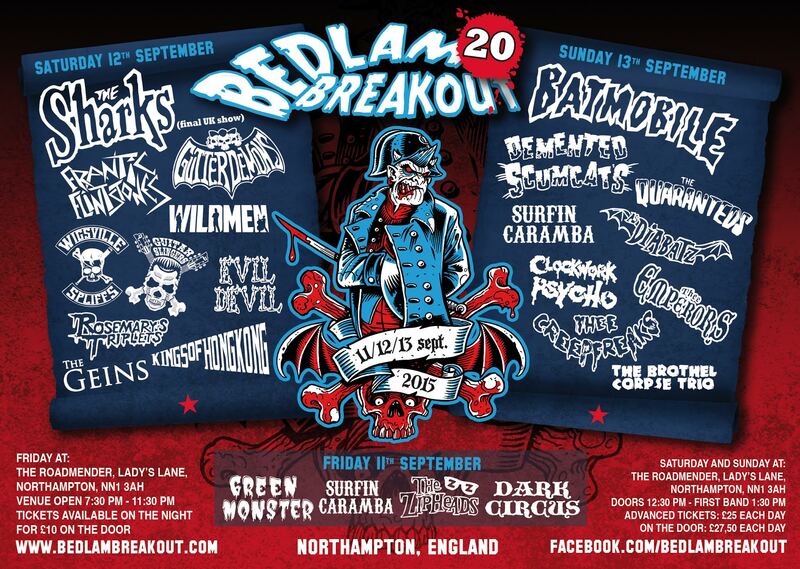 We’ll be playing on Sunday at Bedlam Breakout #20 with Batmobile, Demented Scumcats, Quaranteds, Surfin Caramba, As Diabatz, ClockworkÂ Psycho, Emperors and the brothel corpse trio. We’re playing with Horror Business from Spain, Brocker and Jay Vee & The Cardinal Sins at The Constitution in Camden FridayÂ before Bedlam Breakout. The date is the 19th of June. 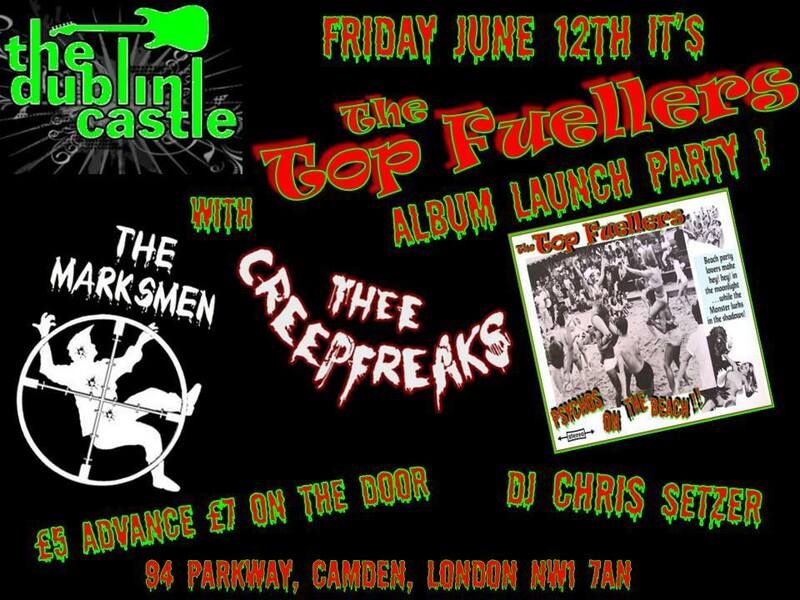 Upcoming gig at Dublin castle at the Top Fuellers record launch with support from our good friends The Marksmen! Dublin Castle, Camden, Â£5 in advance or Â£7 on the door. 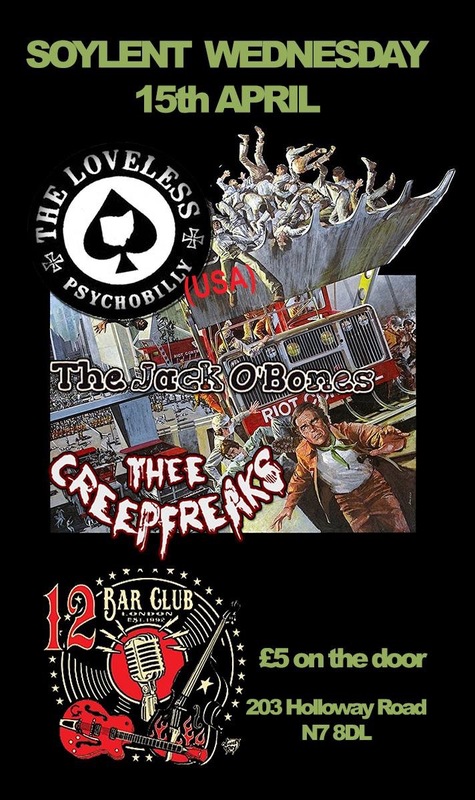 We’ll be playing a gig with The Loveless from USA and Jack O Bones at the 12 bar club on Holloway road on the 15th of April. Will be a crackerÂ and only Â£5 on the door. We’re happy to anounce that we’re supporting Frantic Flintstones at Nambucca in Holloway on the 9th of April. We are happy to announce we’re supporting Cracks from Japan in London on the 3rd of April at the Devonshire Arms in Camden. New line-up, new songs and a new year.